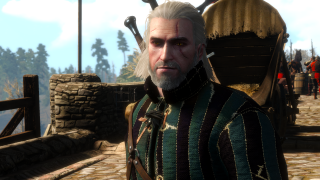 CD Projekt released the 1.05 update to The Witcher 3: Wild Hunt today, which solves numerous problems including the infamous experience point glitch, tweaks and rebalances various aspects of gameplay, boosts the variety of loot dropped and items available for purchase throughout the game, and deploys the Bovine Defense Force Initiative. Wait, what? As Kotaku explains it, the BDFI was introduced to stamp out a simple but economy-breaking exploit. Players can simply kill a bunch of cows, take their hides, meditate for an hour—during which time the cows respawn—and then do it all over again, forever, or at least until they get bored. The hides are very valuable, so it's no problem to raise silly amounts of money in relatively short order. It's cool, it's funny, and it's effective, which is what makes it so great, but it's not necessarily as weird as it might initially seem. After all, it was just yesterday that somebody found Tyrion lying in the Skellige Isles; clearly, the world of the Witcher is a wonderful place in ways we can't even imagine. The full list of fixes and changes in the 1.05 patch, which also includes more practical improvements like better HUD alignment for non-16:9 displays and support for colorblind options, is on Steam.